During GDC Europe 2012, former Rare developer Martin Hollis recounted his experience directing GoldenEye 007, one of the most fondly remembered games of its time and a landmark title in the history of console first-person shooters. Hollis had only worked on one game for Rare at the time, the arcade version of Killer Instinct. When the opportunity arose to pursue a James Bond game in early 1995, Hollis jumped at the chance; as the video above demonstrates, he was a pretty big fan. The rest is gaming history. Hollis went over far too much for us to condense into a single piece (in fact, we've already written two others), but we've compiled some of the highlights after the break. Read on to discover how one of GoldenEye's primary influences was actually Sega's Virtua Cop. In the gallery below, you'll find images of some of GoldenEye's original design documents and some behind the scenes stories from the original team. The genesis of GoldenEye goes back to the days after Rare had wrapped up development of Donkey Kong Country and the arcade version of Killer Instinct in late 1994/early 1995. The studio was approached to do a Super Nintendo game based on the new James Bond film, which Hollis says didn't have a title at the time. Tim Stamper, then head of Rare and the head of the Donkey Kong Country team, actually passed on the project. "I heard about this as a rumor, and I said to Tim Stamper, 'This sounds cool, I'd like to make this game,'" said Hollis, "and he said 'okay.' And that was pretty much my pitch." "I don't really know, and I can't really explain why they trusted me after simply being second programmer on Killer Instinct, but I'm delighted and honored that they did." Before long, Hollis began putting together a team and the project got underway. "In the beginning, we were probably working ten hours a day, but by the end, far in excess of that." 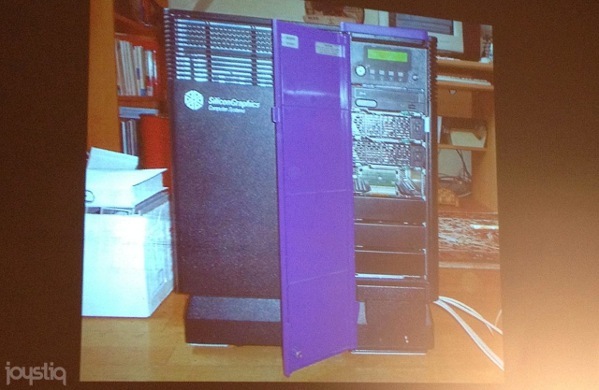 GoldenEye would be built on the Silicon Graphics Onyx – a $150,000 computer roughly the size of a small refrigerator. At the time, it was the closest approximation to the performance of Nintendo's upcoming "Ultra 64," which would eventually become Nintendo 64. "You can see, it's a very large box – it wouldn't fit under every desk – and it emitted huge amounts of heat, [had] four graphics cards and it was not that reliable." Planning began in 1995, and the team was allowed to use "an astonishing amount" of official Bond material and even visit the film's sets. Regarding the actual gameplay, Hollis pictured something between Sega's Virtua Cop and id Software's seminal FPS Doom. "I'd also been playing a lot of Time Crisis together with [programmer Mark Edmonds], and I could see the value of having a gun in your hand, but there was no gun planned for the N64." In fact, the N64 controller hadn't been finalized yet, and the GoldenEye team had "no idea what the control would be like at all." At the time, it was rumored that the control would feature an analog stick, and Hollis wondered if that would work for a shooter. 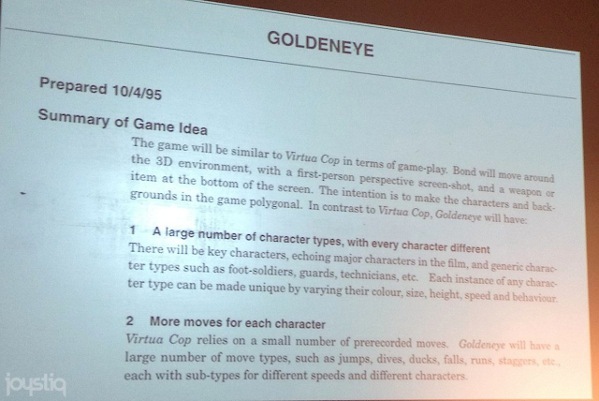 In an original design document, GoldenEye was compared more directly to Virtua Cop. GoldenEye would have more types of characters and a wider variety of actions. As the controller was still being finalized, several control options were considered, including an on-rails approach, again akin to Virtua Cop. Hollis wanted to create "more intelligent characters" than Sega's light-gun shooter. Ideally these characters would react appropriately to a given situation, doing things like sounding alarms, taking orders or even running away. Further, the game would have a greater degree of interactivity, like bullet holes being left in walls. "Pretty much all you have is the gun, and the more the gun can do, and reach out to the environment, and feed back to you that stuff has happened, the better." The design document also included a list of levels, weapons, features, characters and visual effects Hollis hoped to include in the game. "Looking back, this is very naive, this list, because it's so ambitious." He cited the sniper rifle with a functional site as an example of that ambition, noting that development was never supposed to take nearly three years. "You can already see the degree of ambition within me and also within the team in this document." Hollis dedicated an entire page to visual effects (muzzle flashes, smoke, day and night cycles, etc). "Again, really quite ambitious for what was supposed to be a short project." Another sign of the team's ambition is the multiplayer mode, which initially wasn't even planned. Before March or April of 1997, it didn't even exist, said Hollis. It was coded in a month, and added to GoldenEye "without the knowledge or permission of the management at Rare and Nintendo." 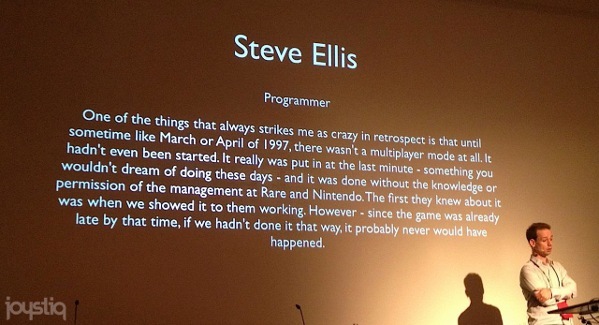 Hollis went on to note that multiplayer wasn't the only feature that was "snuck in," a fact he owed to the trust bestowed upon the team by Rare and Nintendo. "I'm sure there were six month stretches where no member of Rare or Nintendo management came into the team offices," he said, "which is really quite extraordinary, and all credit to them that they felt able to take that much of a lean-back approach and place that much trust in a team." The fact is even more extraordinary given that no one on the team, with the exception of Hollis and artist Adrian Smith, had actually shipped a game before. Hollis devoted part of his presentation to the humor in GoldenEye, which he believes isn't discussed enough. "Any first-person shooter, and almost any game, is a series of hills and valleys of tension," said Hollis. Action is part of "ramping up the tension," while humor can help to relieve it. "Humor's incredibly important for that," he said, noting that it helps give a level "emotional structure." One example of humor – something the team didn't actually plan – was how GoldenEye deals with the physics of explosions. Thanks to the way the game was coded, enemies stand their ground "slightly too long," after being struck by an explosion, which Hollis noted is really quite humorous to watch. "By rights, I should have been sick of the game by the end of two and two-thirds years, but I derive a great deal of satisfaction from just lobbing around a few mines, blowing up people, watching them cascading around." And, of course, there's GoldenEye's fairly silly melee animation. "Nobody ever said – on the team – no one ever said, 'This is ridiculous,'" said Hollis. "It's absolutely hilarious and I love it but, again, you could make an argument that it should be different – more realistic, much more sober – [but] I think you'd be taking out a lot of the character of the game." Anyone who has ever played a multiplayer match of "slappers only" would probably agree. 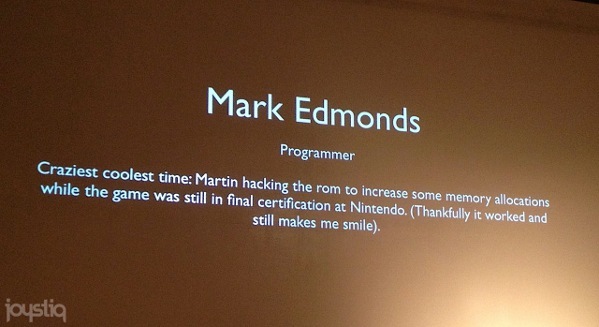 One of the most interesting development stories shared by Hollis came from programmer Mark Edmonds. After the game was finished and sent to Nintendo's Lot Check – an arduous testing process – the final version came back with a problem. A particular level ("probably Frigate"), when played in a certain way, would result in characters appearing with "terrible texture maps on them because there wasn't enough memory." The same day, Hollis wrote a tool to extract the offending code, adjusted the memory numbers, reinserted the adjusted code into the ROM image "without recompiling anything, and sent it to Nintendo." The fix worked, and the untested code became the final version approved by Nintendo. 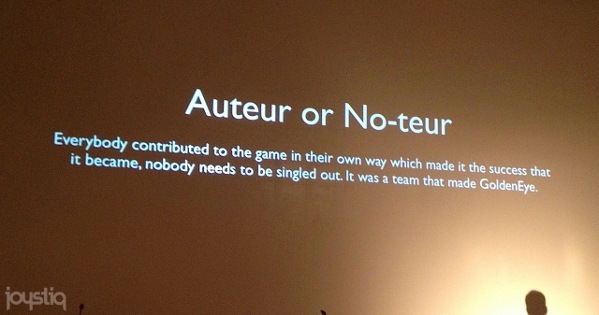 Hollis closed by returning to a question posed at the beginning of his talk: Should a game be considered the work of one "author" or the work of a team of people? "In my opinion, it's really quite toxic to go into making a game with the idea that one person is going to be giving all the orders and telling everybody what to do. I think that's absolutely the worst way to go about making a game." Giving people the freedom to implement their own ideas, and "simply contribute whatever it was that they wanted" was very important. "When you work with incredibly intelligent people, they reward your trust in them, and the most rewarding thing for them is their autonomy," said Hollis. "So really, my take home for this talk is: The less you can be a boss, the less you can be telling everybody what to do, the better the likely results." A project can have "an element of personal authorship" in its early stages, "before the team is really a team at all," he said. Once a team is set, however, collaboration is imperative. "If you're trying to steer a team around, and they're great people, they're going to resist you, and it's going to have an emotional cost on both sides." "So really, I think the best thing is just a couple of drops of yourself in a project, and after that, everybody collaborating."